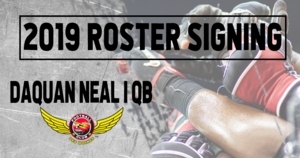 DES MOINES – The Iowa Barnstormers have signed quarterback Daquan Neal to the 2019 roster, Head Coach Dixie Wooten announced today. Neal (6-2, 215, Elizabeth City State) joins the Iowa Barnstormers for his rookie season in the Indoor Football League (IFL). Last season, Neal appeared in one game with the High County Grizzlies of the AAL where he rushed for 86 yards, two touchdowns, and two 2-point conversions while also throwing for 174 yards and five touchdowns. Collegiately, Neal spent three years playing with the Elizabeth City State University Vikings. During his senior season, Neal collected 684 total rushing yards, 3,218 passing yards, and 25 total touchdowns earning All-CIAA Honorable Mention and an invitation to participate in the SPIRAL Tropical Bowl.